I don’t spend all of my time up at the cottage baking and sipping beermosas in the hot tub. We allow plenty of time to hop around to our favorite bar/restaurants too. 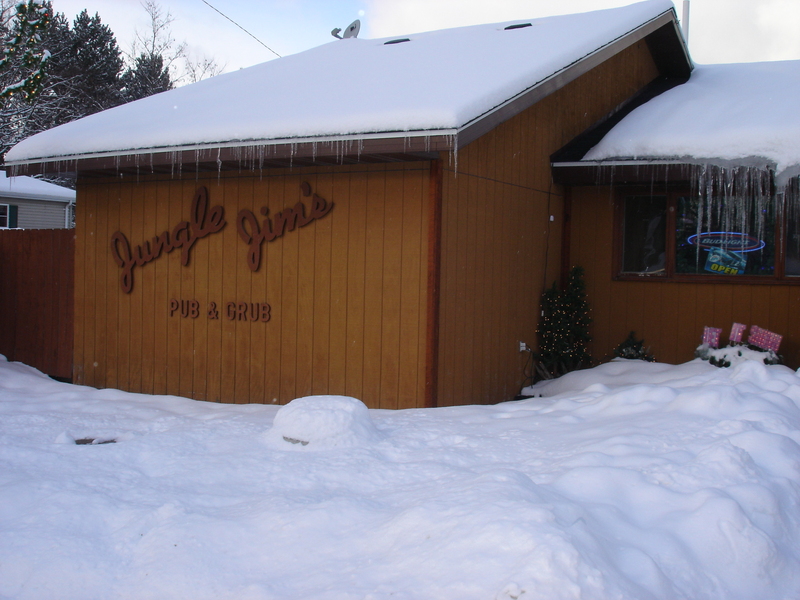 At the top of our list is Jungle Jim’s in Silver Cliff, just a few minutes from our place. Before going gluten free, we would eat there on every trip up north. The food is delish. 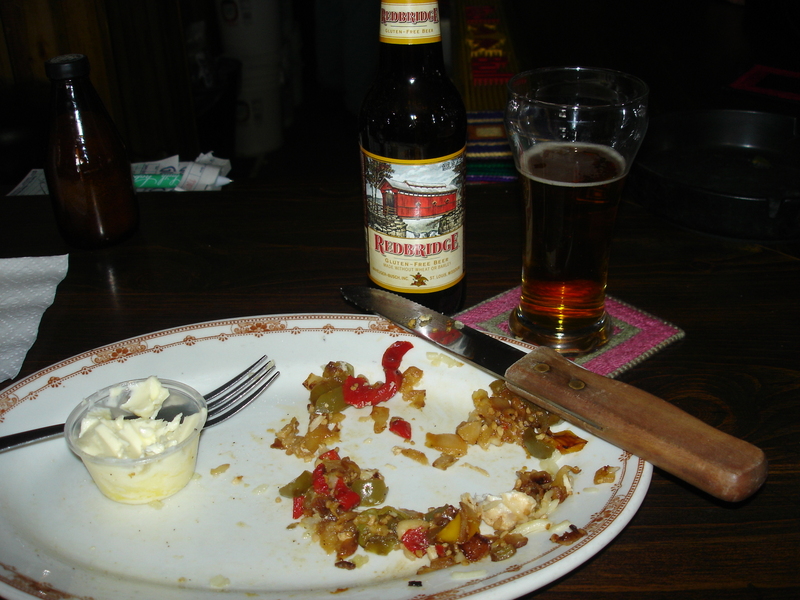 But it’s not just typical bar food, their sandwich menu is extensive and their nacho plates are enough to feed a group! The Voo Doo was my default sandwich until I was diagnosed, check it out on the menu. We have started making it ourselves at home on gluten free bread, it’s just as good! After finding out I have Celiac, Jungle Jim’s food was on hold for a while. I figured it was like every other bar type restaurant, full of fryers and cross contamination. (Don’t worry, we still went there for beverages with the crowd. They have several Smirnoff vodka flavors, which are made from corn, and gf) In August, we were on our Harley trip and ended up at the cottage for a few days. We stopped in to visit one afternoon and Sharon was working. We started chatting about Celiac and the gf diet, and then next thing you know, we’re back in the kitchen reading labels to figure out what I CAN have! Prior to this day, Allan did whip me up a juicy steak and baked potato combo, but we were hoping for another option. I ended up with The Safari (minus the bread) and potato salad. I was in heaven! GLUTEN FREE BEER AT JUNGLE JIM’S!!! I was ecstatic! I quickly finished my drink and ordered a beer. And it started showing up just because I had asked for it. How great are they?!? Now I can go in and order a beer. Just a beer. Not a long explanation. Just a beer. In one of their tiny beer glasses. It makes the beer taste better. Thank you to Allan and Carole for doing what you do and to Sharon for taking the time to make sure there is food for me in the kitchen. Stop in to see them when you are up in the Northwoods. Good food. Good company. Great beer. means Jungle Jim’s for lunch and the Packer game. It was The Safari with a baked potato. I was too hungry for pictures when it arrived. But it was good. Posted on December 31, 2009 by Sarah @ Celiac in the City •	This entry was posted in RESTAURANT REVIEWS and tagged gluten free at Jungle Jim's, Jungle Jim's Silver Cliff, wi. Bookmark the permalink. We had been to Northwoods for the long weekend. Jungle Jims was our default destination for breakfast, lunch and dinner. We had the Sunday breakfast, which was awesome. The Voo Doo, Head Hunter, and all the other things that we had were great. The ambience, food and the people were awesome! Jungle Jim’s is Awesome ! Try the King of the Jungle ! Pulled Pork on a Hamburger topped with Onion Straws. .
My husband is GF and was very bummed when he couldn’t have beer. 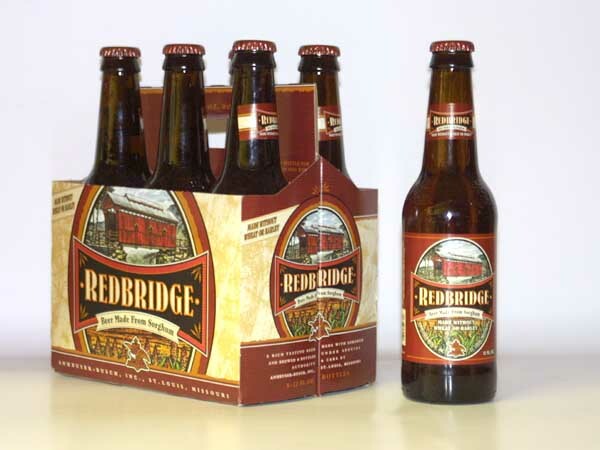 We have had Redbridge before and he really liked it. We had some problems finding it so I asked the liquor manager at our local Pick n Save if he could get it for us. Well this afternoon the shipment is coming in and the Pick n Save in Oconomowoc will now have another option for GF beer. I was very excited about this and it was so easy to request the product. You’re right Chelsie… it is SO easy to get your local grocers, bars or restaurants to order beverages we can enjoy. Good for you! Check out the post about our Gluten Free Get-Together on February 18th in Wauwatosa, we would love for you to join us! great to hear. While I do not have celiac more than a few family members do. I would like to ask if you have the recipe for the bread you mention? We have tried to make bread but cannot get it just right and would like to try the recipe you use. Thanks for the interest Alan! I hope the bread turns out for your family members. Stop by again soon!